I am not one to give attention to the ignorant because it empowers them. I am also someone who, in 2017, can't believe we still have to deal with this maladjusted thinking and new levels of moronic reasoning. But when you defile my ballpark, my team, my city (I may live in Pittsburgh, but I have roots in Boston), and my game, then the gloves come off. As if Boston has not had to deal with enough problems over the past decade, issues with race seems to be the one constant umbrella of sh** that Boston can not crawl out from under; although she continues to try and is not going to give up anytime soon. 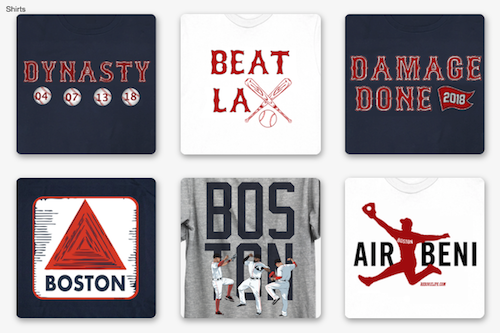 Because if the good people of Boston are anything they certainly resilient. On May 1, 2017, Adam Jones of the Baltimore Orioles was playing Centerfield and had to be subjected to racist taunts and vile comments by some spectators at Fenway. He commented that one fan threw a bag of peanuts at him and the "N-word" was being hurled at him harder than a Sale fastball. The Red Sox organization issued an immediate apology to Jones who also received a standing ovation from the masses at the park the next night. See Adam Jones discuss his ordeal here. On May 3, 2017, a loud-mouthed "fan" used a racial epithet to describe his view of the rendition of the National Anthem, which was sung that night by a woman from Kenya. 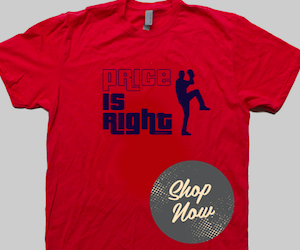 That man was issued a lifetime ban from Fenway for his ignorance and efforts. 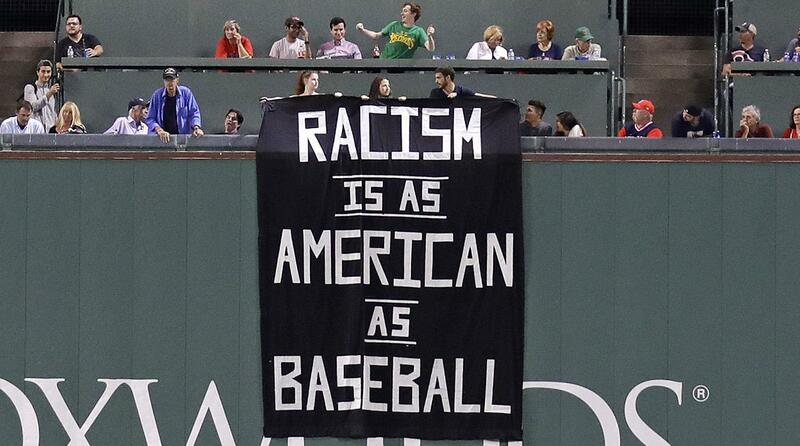 Then, last night, on a beautiful September eve, in the most beautiful ballpark in America, four morons decided to hang a banner reading, "Racism is as American as Baseball" from the most historic and sacred monument in Boston...The Green Monster. 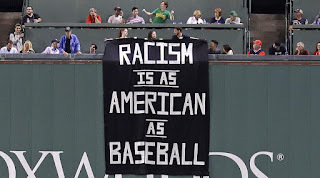 I have a few things to say to the disgusting, poor excuses for human beings and their piece of sh** banner: You do not represent Red Sox Nation nor do you understand baseball. Baseball is America's past-time. No where in baseball is there room for segregation, hatred, or differences. It is a game of teamwork, people coming together for a common good. It is pure. It is clean. It is what causes wonderment and awe in the eyes of children. It is a game of dreamers; children wanting to grow up to be like their favorite players. It is a game of skill and excitement. Mr. James Earl Jones puts it more eloquently than I do here. Racism offers none of that. No, racism is not as American as Baseball. Racism is not solely American. It doesn't belong to one nation or nationality. If my grandfather, who fought the Nazis in Germany in the 1940's, was still alive he would tell you the same. No, racism is NOT as american as baseball. I will never understand the maladjusted logic and moronic rationale which people use to allow themselves to hate another because of the color of their skin. One thing is certain, people are not born racist. It is not something that is innate in you. It is something people have to work at, and the people working at it are usually the most misinformed, misguided, and hateful. Thankfully, there are people who do not subscribe to this way of thinking. People who continually are fighting against it. For example, in August, Red Sox owner John Henry began discussion about changing the name of Yawkey Way outside of Fenway Park to something else because of the negative association between Tom Yawkey and his reasons for becoming the last Major League Baseball team to integrate nearly 59 years ago. On behalf of all the real members of Red Sox Nation, I apologize for the actions of those four spectators last night and I hope that at some point in their lives, they get a clue and realize that nothing good or productive comes from hate. We all need to work together toward change. It is possible. I can happen, and it will happen.